The Czech Pastry That Took Texas By Storm, And Keeps Gaining Strength : The Salt Kolaches have been a Lone Star staple for a long time, and some have even taken on a sausage-and-jalapeño twist. Now their popularity is expanding, with both big and small companies getting onboard. Ask any displaced Texan what they miss from home and they'll likely list a few items: brisket, football, higher speed limits, tacos and kolaches. Now, if you're lucky enough to have had a kolache, you know it's a Texas staple, but if you haven't had one, you're probably still trying to figure out how to pronounce the word. It's "ko-lah-chee." Kolaches are Czech pastries made of a yeast dough and usually filled with fruit, but sometimes cheese. The ultra-traditional flavors — such as poppy seed, apricot, prune and a sweet-but-simple farmer's cheese — can be traced back to the pastry's Eastern European origin. As Czech immigrants founded communities during the 1880s in rural Texas, later known as the Texas Czech Belt, the flavors and fillings evolved. Pineapple, blueberry, strawberry and cream cheese are just a sampling of flavors available today. Mimi Montgomery Irwin owns and operates The Village Bakery in West, Texas. In a town full of Czech immigrants, her father, Wendel Montgomery, opened the bakery in 1952 on a dare from a high school football coach and local priest, she says. "People thought he was crazy. At that time, in our town of West, it would be like ... selling ice to Eskimos, because everyone made them. But something interesting was happening in society," Irwin says. Kolaches, a staple among these Czech communities, appeared at church dinners, bazaars and family gatherings, but were fairly unknown to outsiders. Irwin's father found a market in traveling salesmen as they stopped in for food and gas. The pastries soon became a favorite of passersby. While traditional kolaches are fruit-filled, a Texan twist evolved when they were made with sausage, cheese and jalapeños. Irwin, a self-proclaimed kolache purist, maintains that these are not true kolaches, but rather what her father called a "klobasniki." Over time, kolaches became more commercialized in Texas, often paired with doughnut shops and made with doughnut dough. Filling them with meat is a misunderstanding that Irwin says she tries to correct. "I try to help them understand that when they ask for a kolache, they should not be getting meat. And in many of the chains, that's what's being passed off as a kolache," Irwin says. For Czech communities outside of Texas, Irwin is right. In Iowa, where there is also a large Czech community, kolaches can be found in grocery stores, but they're most definitely filled with fruit, not meat. 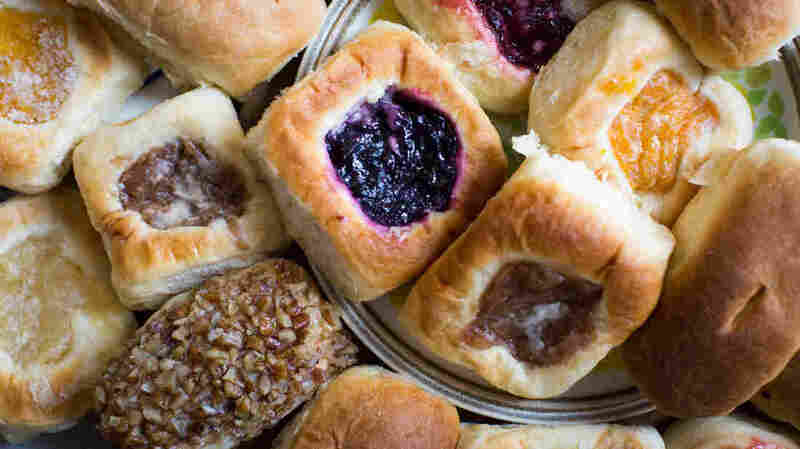 There are other differences: Iowa's kolaches have a rounder shape, with the fruit filling covering a larger area than their square-shaped Texas counterparts. As small communities continue to use food to spread culture, big companies, like The Kolache Factory, which is headquartered in Texas, have started to build franchises in other states. At the same time, kolache recipes have been continually passed down through generations. 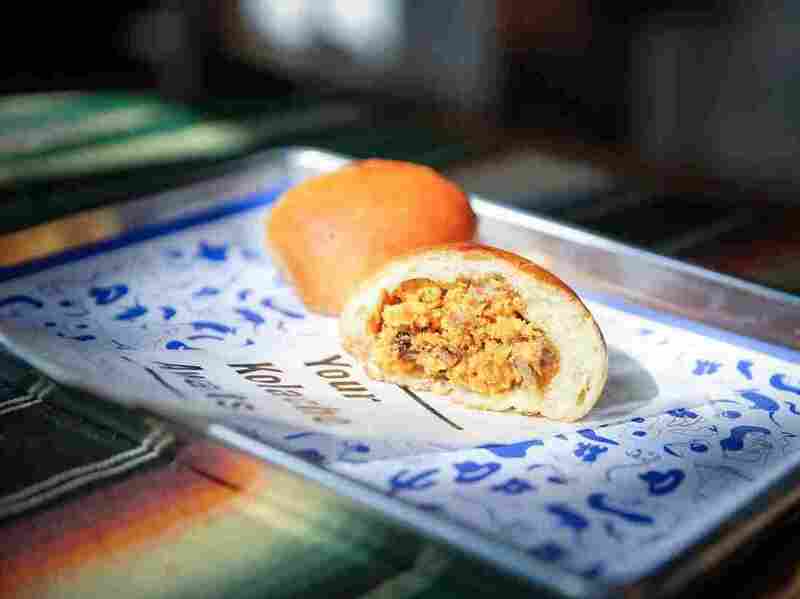 Some Texans of Czech descent, like Chris Svetlik, have started smaller shops like Republic Kolache in Washington, D.C., after realizing how many people missed the familiarity of this comfort food. "They grew up there, they spent some time there, they did military service there. You'd see a lot of folks that would literally wear their Texan pride — they'd put on their hat or their shirt of where they went to school or a local Texas chain," he says. "A lot of our customers met one another in line and had good conversations. That's been really cool to see, not just seeing our regulars, but having them get to know one another." Republic Kolache started serving pastries, both sweet and savory, to people in the D.C. area in August 2015. Svetlik and his partner, Brian Stanford, were greeted with more demand than they could meet as hundreds lined up for a taste of home. And as the company expanded and partnered with coffee shops and grocers like Whole Foods, it wasn't just Texans who were lining up. As the presence and popularity of kolaches continues to expand, Svetlik says, it doesn't matter if someone has heard of the food or tasted it before. "Even if the name is kind of funny — and maybe folks have never heard of it — it is the time-honored tradition of dough with stuff in it, which is quite familiar. It's not too hard to understand or get on board with," Svetlik says.